Based on reviews from 489,217 users. Learn how our rankings work or see our guide to skate sneakers. Updated Apr 2019. Before 1998 – the year when Tony Hawk became a pro and extremely popular because of the 900 trick – skateboarding was underground and people who wore skate sneakers were indeed skaters and are well-versed with the skate culture. Before the boom of skateboarding, skate sneakers were exclusively made by skate brands and are only available in skate shops or through the mail. Skate shoes then were distinct and bulky, and people knew immediately that it is for skateboarding and that the person wearing it does skate. However, in the present time defining what makes a skate shoe could be ambiguous. Today numerous giant sports brands have had their hand in creating skate sneakers with some resembling running or tennis silhouettes while others are merely skate-inspired and lean more toward style and aesthetic purposes. Colorway selections are also broader and more creative - from vibrant hues such as red, blue, yellow, and orange to more classic ones like grey, beige, and black. Below is an extensive list of all things casual skate sneakers, from famous models to typical features and more. Skate sneakers are lifestyle footwear that takes after the aesthetics of performance skate shoes. This type of kicks are designed for casual everyday use and does not possess the essential features of a technical skate shoe to be able to support and protect the wearer's feet against the sports' demands. Initially, skate shoes were non-existent. Pioneer skaters started riding boards barefoot and eventually favored ordinary casual sneakers to protect their feet from the board. With this being said, most skate sneakers' aesthetic takes after ordinary casual shoes. However, as the sport became more popular physical attributes of lifestyle skate shoes have evolved and took a variety of forms. Below are the typical characteristics of today's latest skate shoes. Performance skate sneakers’ upper materials are an essential technical feature for days spent shredding in the skate park. Lifestyle skate shoes, on the other hand, don’t need as much protection compared to the technical models but these upper materials could also provide support and stability for daily casual wear. Listed below are some of the most common fabrics used in skate sneakers. First generation skaters from the 60s adopted sneakers with canvas upper and exceptional grip to protect their feet while performing tricks on the board. This upper material became iconic and is continued to be utilized today especially in lifestyle skate sneakers. Canvas doesn’t offer as much durability and support as the fabrics listed below, but it is the most breathable. Brands such as Vans started incorporating leather in their skate shoes as an answer to the market’s clamor for added durability against tears and abrasions. Also, with lack of choices skaters in the 80s preferred to skate in the Nike Air Jordan 1 for its leather uppers and higher profile. Today, most skate shoes are crafted from this material for its ability to shape after the wearer’s feet and longevity. This material is another type of leather which means that it is also durable and supportive. But unlike the traditional leather, most skaters prefer suede because it camouflages scratches and abrasions better than the smooth surface of leather textiles. Also, it adds a stylish texture to the skate sneaker’s overall design. Skate sneakers are offered in three cuts: low-, mid-, and high-top profiles. Each of these silhouettes has their advantage and disadvantages when it comes to one's performance on the board. However, lifestyle skate shoes' cuts are generally considered to be for style purposes rather than a functional one. 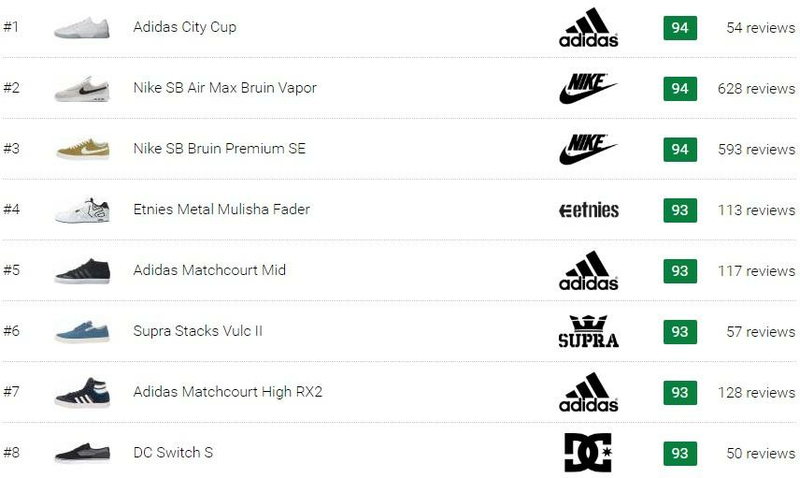 Discussed in detail below are skate sneakers' different profiles or cuts. Majority of skate sneakers are constructed with a low-top profile with its collars sitting below the wearer's ankle. Generally, these shoes are lighter in weight compared to pairs with mid or high-top silhouettes. Because of its lower profile, there's more freedom for ankle movement and room for flexing and bending, however, for the same reason, low-top skate sneakers do not offer any ankle support and stability. Style-wise, skate sneakers with a low-top profile boast of versatility and ease of use. Modern low-top skate shoes today typically have a streamlined look fashioned after the market’s latest craze on minimalism and lightweight. Mid-top skate shoes are the fewest in availability. These shoes’ collars sit right on top of the ankle providing more ankle support and protection compared to the low-top ones and less restriction compared to high-tops. The second most preferred silhouette by skaters is the high-top. With its collar extending past the ankle these skate sneakers offer ample ankle support, protection, and stability while also adding an eye-catching element to the wearer’s ensemble. Despite these advantages, others dislike it because it tends to be heavier, bulkier, and more restricting than the two previous silhouettes. Equally important as the upper's materials and construction are the shoe's midsole and outsole. With skate sneakers being derived from performance skate shoes, the midsole and outsole technologies are usually passed on to the lifestyle skate designs including cushioning and traction. Typically made from EVA, PU foam or TPU, midsoles are constructed to provide cushioning, shock absorption, and impact protection. Skate sneakers often come in two sole constructions: vulcanized or cupsole. Vulcanized soles offer lighter weight and greater board feel, while cupsole provide more cushioning and tends to break-in longer. With today's emphasis on sneaker technology, performance skate shoes are usually decked out in innovative elements that focus more on enhanced durability, lightweight fit, and impact protection. These modern-day inventions make the distinction between technical skate shoes and casual skate sneakers more apparent than before. However, old skate shoes were hard to distinguish from lifestyle ones due to lack of innovation and are also often used as casual footwear. That being said, almost all skate-inspired lifestyle sneakers today are usually retro models from the skate culture's younger years. Formerly dubbed as the Style #44 deck shoe, the Authentic is the brand's first sneaker design and is recognized as the shoe that unintentionally attracted a skater clientele due to its grippy outsole. It is a lifestyle pair that took inspiration from boat shoes, but skaters having no other better option ran with it and completely changed the brand's direction ever since. Initially called the Vans #95, the Era was Vans' first skateboarding sneaker. Designed by famous Z-boys members Tony Alva and Stacy Peralta, the shoe featured a padded ankle collar and rubber waffle outsole for more grip and traction. Although this shoe was manufactured back then with skateboarding in mind, today it is considered as a lifestyle pair due to its lack of innovative features. Another Vans kick makes it to the iconic list and for a good reason. Designed with convenience, the Slip-On was manufactured as an answer to the market's demand for laceless shoes however skaters found that the upper eventually became too loose after a number of skate sesh, but surfers loved it. This pair gained international recognition after being featured in the teenage film called Fast Times at Ridgemont High, worn by Sean Penn in the iconic checkerboard print. This sneaker was conceptualized due to persistent market demand for a Vans skate shoe with more ankle support and protection. The company decided to base this pair's design on the Old Skool's aesthetic and from there added height and cushioning. Skaters at that time loved it for its simple look and functionality while consumers today favor it for its rich history, representation, and versatile style. Also referred to as the Nike SB x Diamond Supply Co. collaboration, this shoe builds on the popularity of the Nike Dunk as a skate shoe. Considered as a collectible, the “Tiffany” shoe displayed a teal blue color that’s based on a famous jewelry brand’s packaging. Its unique color and limited quantity contributed to the shoe’s popularity and became an instant sell out. Early skateboarders weren’t given as much footwear option back then and had to work their way through whatever’s available in the market. From its inception in the 60s until the late 90s, skate sneakers weren’t as readily available as it is today. And as a result, skaters typically gravitated towards non-skate shoes with superb cushioning, stability, and grippy outsoles. Moreover, with skate’s rebellious nature skaters also skated in non-skate shoes – just because. Here are some of the notable non-skate silhouettes that became prominent amongst long-time skaters. This timeless favorite was designed as a basketball kick, but because of its vulcanized outsole and ankle support skaters from the 60s favored it. Today this shoe remains a staple for plenty of consumers and comes in a wide array of color options and designs. Michael Jordan’s controversial basketball kick had a far reach beyond the hoops court and the streets, as even the skateboarding culture warmly welcomed it in their world. Skaters preferred it for several reasons: its superb and then-innovative Air cushioning, reinforced leather panels throughout the upper for added durability, responsive outsoles, added ankle support, and bold color schemes. Pro skateboarders were frequently seen rocking this shoe in skate movies helping establish its reputation in skate culture. In the early 1990s skate shoes went back in time as pro skaters started to rock 70s sports sneakers. One of the most famous retro shoes that boomed in the 90's skate scene is the Puma Clyde. Seen continuously on pro-skater Mike Carroll, it started the craze of retro, streamlined non-skate silhouettes amongst skate enthusiasts. Celebrated as the first basketball kick to utilize a low-top profile, the Superstar’s durable shell toe design, leather upper, and affordable pricing also appealed to skateboarders during the 90s. This pair’s shell toecap proved to be practical for skaters as it takes them longer to rip a hole into it. Another hoop shoe crossed over to the skate sneakers list. George “The Iceman” Gervin was the first to wear the Nike Blazer, and it enjoyed its fair share of success in the court. However, the shoe’s basketball fame was cut short soon after its release because the brand decided to focus on developing the Air technology for basketball shoes, which most hoop players favored over the Blazer. But the shoe’s superb traction and suede upper got skater hooked for its grip and durability. Since then the Blazer has been marketed under Nike skateboarding sub-label. One more of the Swoosh brand’s basketball kicks gets adopted by skateboarding. The Nike Dunk’s main basketball features, such as cushioning, lateral support, and special pivot traction, were the reasons why skaters took it under their wing. Moreover, Nike Dunks that were released between 1998 and 2000 came with nylon tongue further captivating skateboarders. Along with skateboarding’s rising popularity comes more and more companies investing in manufacturing better and technologically advanced skate shoes. This progress somewhat helps in creating a clear line between performance skate shoes and lifestyle skate sneakers. Most skate-centric brands such as DC, Etnies, and Supra provide a type of distinction between their lifestyle skate models and performance skate shoes by adding ‘Pro’ in the shoe’s name or grouping them accordingly in their official sites. However, distinguishing lifestyle and performance skate shoes could be tricky when it comes to more general sports brands such as Nike, Adidas, and New Balance. Generally speaking, all casual skate shoes feature at least one essential characteristic of a performance skate shoe, but what sets the latter apart is that it is decked out in technologies that make it more durable and capable of doing a better job than the former. Note that drawing a clear line between lifestyle sneaker shoes and performance skate kicks could be unattainable due to the DIY and rebellious nature of skateboarding. To aid you in your quest for your next skate-inspired sneaker purchase, we've rounded up some of the brand's newest lifestyle skate models below. The Three Stripe brand officially launched their skateboarding line in 2006, as they saw a growing market and business opportunity in it. Prior to its official establishment, skaters have been using select Adidas lifestyle sneakers for skateboard­ing, and these specific models have been the basis of most of the brand’s current skate sneaker designs. Nike Skateboarding (SB) debuted in March 2002 in an effort to keep up with the burgeoning skateboarding market at that time. After two unsuccessful releases, the Swoosh brand commissioned pro-skater Paul Rodriguez in an attempt to establish a legit name in the skateboarding world. Apparently, this strategy worked out as the Nike SB line is considered as one of the brand’s hottest sub-categories. Vans has been in the game since the 70s and is recognized as the first brand to manufacture skate shoes officially. The company played a significant role in skate culture's progression to where it is today. Vans continue to enjoy success and popularity, especially among the youth due to their designs' affordability and retro looks. Launched in 1994, DC was one of the few skate brands that existed during that time. Initially selling clothes, the brand is revered today for its premium skate models. DC has currently added several other extreme sports such as motocross, surf, snowboard, and BMX in its lineup. Etnies debuted in 1986 and is recognized as the first skate brand to be owned by a skater himself. This small fact was a big deal among old school skaters as it sort of warrants the company as an authentic skate brand. Today, Etnies houses a variety of sneaker types, from vegan to BMX-inspired and collaborative pieces. Below are a number of the brand’s skate-inspired sneakers. What’s the difference between performance skate shoes and lifestyle skate sneakers? As mentioned earlier, when the sport was in its younger years footwear made for skateboarding were purely used for shredding on the board. Today, trying to set a clear line between which models are for skateboarding and which ones are not could be tricky. Moreover, consumers are frequently seen rocking a pair of performance skate shoes just because of its sleek and stylish design. Primarily skate sneakers have less technology and often are less durable compared to performance skate shoes. Casual skate footwear is usually crafted from traditional canvas uppers and has a vulcanized sole – although offering great board feel it is less durable than skate shoes with suede uppers and reinforced leather underlays. How much do skate sneakers cost? Due to skateboarding's culture and roots of DIY and improvising, skate footwear is generally known to be less pricey compared to other types of shoes. However, there are also skate models that fall under the premium price range. These upscale skate designs are oftentimes pro, signature, or technologically advanced releases. What are some footwear technologies used for skate? With the physical demands of skateboarding, technologies for footwear to help the wearer perform better and make the shoe last longer are significant factors. Each of the brands offers their signature technologies that cater to these demands. Below is a list of some of the brand's skate technologies. GEOFIT – aids in offering the wearer better fit and comfort by adding cushioning in all the right places. The skate should experience snug fit, enhanced stability, increased comfort, and greater board control. ADIPRENE+ - is a cushioning technology that provides impact absorption. It is an insole where padding is mostly placed in the heel area where the impact is strongest. ADITUFF – It is an internal material that’s added in the shoe’s upper to provide enhanced durability and longevity against tears and abrasions. Free - a cushioning technology that’s created to provide the wearer with a barefoot feeling. It allows excellent board feel and support. Hyperfeel – incorporates several of Nike’s other technology creating a perfect concoction for light, supportive, and comfortable fit. These technologies are Flyknit for a sock-like fit, Flywire lacing system for lateral support, and Lunarlon insole for comfort and impact protection. UltraCush Lite – a special mix of various foams to provide super lightweight cushioning and impact protection. WaffleCup – the very first vulcanized cupsole. It fuses both the benefits of a cupsole and a vulcanized sole in order to provide support and durability and excellent board feel and grip. Impact – I – a cushioning technology that seamlessly combines boardfeel and impact protection. It utilizes inverted cones of a lower rubber density to allow compression upon landing, which protects your feet without sacrificing flexibility and board feel. Super Suede – a technology utilized on the shoe’s upper that enhances its durability against abrasions and tears. Skate shoes are designed to have flat soles to allow excellent board feel and manipulation of the board. Due to this reason, some people with feet problems could have serious issues when they use skate sneakers for long periods of time or physical activities. Ultimately, skate shoes do not provide ideal comfort for walking or running. Which skate sneakers are vegan-friendly? With a growing number of consumers switching to a plant-based diet, more and more brands are designing vegan-friendly products. These items did not utilize any animal by-product and are considered eco-friendly. Here are some vegan-friendly skate shoes. How to style skate shoes? Skate sneakers generally have a simple design and silhouette, making them easy to incorporate into a wide array of casual ensembles. Depending on your mood and the look you’re going for, you could style these shoes through accessorizing and mixing and matching different pieces. Vintage – printed button-down tee, cropped chinos, colored socks, and a beanie. Athleisure – crewneck sweatshirt, chain necklace, sweatpants, and a five-panel cap. Effortlessly cool – T-shirt, shorts, high socks, and chain necklace. Casual feminine – sleeveless top and a mini skirt. 90s – striped short, high-waisted jeans, and a rucksack bag. Rock chic – T-shirt, leather jacket, and skinny jeans. When and how did skateboarding start? Skateboarding started in the 40s when Californian surfers couldn't ride in the ocean because there weren't waves. They were so bored that they improvised a game that emulates surfing to pass the time. This game was called sidewalk surfing, and boards were crafted from a piece of wood metal and wheels. The sport started to gain traction when a group of young boys called the Z-boys began innovating and pushing the envelope when it came to tricks and performing on the board. From then on, the sport only grew more significant and more popular to where it is today.